It was almost two years before I saw Virginia again. When we met for the second time, it was in the Vatican Library. 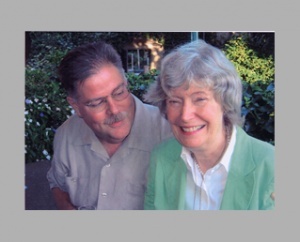 I was a fellow of the American Academy in Rome that year and Ginny was on leave from the Pontifical Institute, staying in an apartment near the Vatican City. Ginny's apartment had no washing machine, and I found myself being gently encouraged to offer Ginny (against strict academy rules) the use of the American Academy machines. We took to having a regular 'date' on Saturdays. Ginny would bring over her laundry, slipping in by the rear gate, and I would keep watch while she did her laundry. We'd then go to Mass at San Pancrazio afterwards, followed by dinner at the Academy. Ginny more than reciprocated the favor by taking me in her car, a red Fiat 126, to the various libraries I wanted to visit for my work on the reception of Plato. We took several long trips around Italy together, and I found that Ginny was the ideal travelling companion. Friendship turned imperceptibly into love, and by the end of my American Academy year, I was sure Ginny was the woman I wanted to marry, despite the difference in our ages. Ginny was not so sure, and it took me another year of incessant letters, phone calls, flowers and Latin poetry to get her to take the plunge. My attempt to write Latin poetry for Ginny was my first encounter with her gentle but firm editorial manner. I thought myself a pretty decent Latin versifier, but Ginny's eye uncovered an embarrassing number of errors in usage and prosody. Several drafts were usually necessary before the offending lines were rendered acceptable and could be entered in the libellus amoris. It was during our trips together in Italy that I gradually learned Ginny's story. She had grown up in Lake Providence, Louisiana, a small town in the northeast of the state near the Arkansas border, in what was and still is the poorest county in the United States. Her father was a businessman and the editor of the local paper, the Banner-Democrat; her mother was a Latin teacher. Ginny had learned her Latin, literally, on her mother's knee. As a girl, she attended the proverbial one-room schoolhouse, St. Patrick's Catholic School, where she was educated by nuns. They must have been excellent teachers. The only other member of her graduating class, George Lensing, known as 'General', also became a scholar, ending up as a professor at UNC-Chapel Hill and a major authority on Wallace Stevens. But at St. Patrick's he always graduated in the bottom half of his class. Ginny's extraordinary academic ability was already evident to her parents, and it was clear that she would have to leave Lake Providence in order to find a school that could challenge her. So she was sent as a boarder to the Sacred Heart Academy in New Orleans, “sin city” as Ginny liked to call it, not that she had much direct experience of its sinfulness. Sacred Heart Academy was located in a large Colonial Revival building on St. Charles Street. Ginny quickly stood out as an academic high-flyer, and brought glory to the school in her senior year by winning the all-city Latin prize, the first time the prize had been won by a female - in fact the first time the prize had not been won by a boy from Jesuit High School. Ginny remained a faithful Sacred Heart girl to the end of her days, and always attended first Friday masses when she could. After high school Ginny chose to go to Manhattanville College of the Sacred Heart, at that time among the best Catholic women's colleges in the country, which had the added attraction of being close to, but not in, New York City. There Ginny realized her childhood dream of going to the opera, and began a life-long love affair with Italian opera. For her major, Ginny hesitated between Latin and Biology, but decided in the end to do Latin. She was thinking already about graduate school, and thought that, as a graduate student in Latin, she might be able to realize another dream - to go to Italy. Ginny had yearned to go to Italy ever since seeing Roman Holiday, starring Gregory Peck and Audrey Hepburn, at the age of eight. So in 1962 she set off to the University of North Carolina at Chapel Hill to study classics. At Chapel Hill she did excellent work as always, but the chair of the Classics department had limited ideas about what a proper academic career for a young lady might be. He envisaged her teaching Latin at a nice southern college for women, and was already, without her knowledge, making arrangements to that end. But Ginny had no intention of letting him plan her life. In her second year at UNC she had met Berthe Marti, from whom she took her first course in medieval Latin. Marti was a Swiss émigré, a Bryn Mawr Ph.D., and an accomplished scholar in the field of the classical tradition in the Middle Ages. Ginny was excited by Marti's research on medieval Lucan glosses, and even more, I suspect, by her attractive style of life: for Marti spent every fall in Rome and taught at Chapel Hill in the spring. That was close to being Ginny's idea of heaven. With Marti's encouragement, Ginny evaded the career plans being made for her, left Chapel Hill with an MA, and was accepted into the PhD program at Harvard. Though Ginny found the environment at Harvard intimidatingly masculine, she remained grateful to Harvard throughout her life that the institution had encouraged her to pursue a life of scholarly research. At Harvard Ginny's advisor was Wendell Clausen, an eminent expert on Roman poetry and a text editor with a good command of paleography and other editorial skills. In her first term at Harvard in 1964 Ginny took his seminar on paleography and wrote a paper that became her first publication, “The 'Insular Intermediary' in the Tradition of Lucretius.” This appeared in Harvard Studies in Classical Philology in 1968. Her work with Clausen confirmed Ginny in her orientation towards textual studies and paleography and away from literary criticism (which Ginny with gentle sarcasm liked to call “Truth and Beauty”), for which she confessed she had no talent. This was partly her genuine humility talking, but it also reflected her hardheaded judgment of the type of scholarship that was likely to endure. Through the influence of Clausen and Berthe Marti, Ginny won a 2-year graduate fellowship to the American Academy in Rome, the so-called “Rome Prize” (1966–68). In those days it was more common for fellowship recipients to go by ship than by air, so Ginny took an ocean liner to Italy, via the Portuguese coast, Gibraltar, Spain and the islands of the western Mediterranean. Ginny's first port of call in Italy was what remained her favorite Italian city - Naples. However, Ginny was disappointed by her first glimpse of Italy. It was a foggy morning and she was unable to see the famous view of the Bay of Naples. As the ship approached the dock, Ginny finally saw a neon sign looming out of the mist - a huge sign advertising Fiat. Ginny later came to see this as prophetic, since she spent many years, in a series of Fiat cars, travelling all over Italy on her various manuscript hunts. Rome gave her a similar welcoming sign. She first saw the eternal city from the train, looming up behind a Coca-cola sign. Coca-cola was for most of her life Ginny's preferred form of liquid refreshment, and she took the apparition as a favorable omen and a sign that Italy would provide her with her favorite form of spiritual refreshment, which indeed it did. In her second year at the American Academy, Ginny met up again with Berthe Marti. It was Berthe who informed Ginny that the great paleographer, E. A. Lowe, then at the Institute for Advanced Study in Princeton, was looking for an assistant. Ginny applied and was accepted for the position. Lowe was nearly 90 at the time and Ginny worked for Lowe for just a year before the great man died. Ginny was kept on by the Institute for an additional year to put Lowe's papers in order. It was while working on Lowe's papers that she first had the idea of updating Lowe's seminal work on The Beneventan Script (1914). Ginny's “update” eventually became an entire volume in itself, which was added to the original work when the second edition appeared in 1980. In preparing the second edition of Lowe's book Ginny was to find her own life's work, which was to recover the manuscript record of the terra sancti Benedicti and to date and localize the surviving specimens of Beneventan script. Like my fellow students, I approached Miss Brown's classroom for the first time in a state of fear and trembling. Here in front of the class was a young, slim, attractive blond woman, who spoke softly, with a strong southern accent and a marked stutter. In my state of anticipatory anxiety, I found her introduction to the course impossible to hear or understand. A look at the material we were assigned turned my anxiety into panic. I'll never know quite how Virginia Brown achieved the miracle, but over the next few weeks I became enthralled with her class. My imagined difficulties in understanding her lectures faded imperceptibly, the minims in the manuscripts sorted themselves into words that made sense, and I spent hours hot on the trail of one elusive quotation after another. By the end of the year, I had completed the course successfully and had found my favorite professor and a valued member of my dissertation committee. Weighed down with the burdens of teaching a demanding course and editing Mediaeval Studies, Ginny's leave-year trips to Italy became halcyon intervals in which to pursue her research. While she always continued her work on the classical tradition, and especially on Vergil, the center of her interests increasingly centered on the Beneventan script. She particularly enjoyed criss-crossing central and southern Italy and Dalmatia in her little red car, visiting hundreds of monasteries and archives, to hunt for new examples of 'The Script', as she called it, or sometimes 'The Precious Script.' Once she had fallen into this pattern of research, her life turned into a kind of adventure, where there might be a new piece of Beneventan around any corner, even in the unlikeliest of places. An extreme example of this occurred when we went for the first of what became annual trips to the Caribbean. Niko Knauer had recommended to us, for its peaceful isolation, the tiny island of Staniel Key, population 131, in the Bahamas. The 'resort' we found ourselves in was essentially a filling station for yachts with a restaurant attached and some basic wooden shacks for the guests. Ginny heard from the owner that the island had a library. The 'library' turned out to be a one-room breezeblock structure with a selection of paperback novels. I remember saying to myself, trying not to roll my eyes, 'She is NOT, please God, going to go and ask whether they have any Beneventan.' But of course Ginny couldn't resist, while interviewing the puzzled African librarian, asking her about The Script. 'Ever hopeful am I', Ginny liked to say, and indeed she was. I did not know her well, but every time I saw her, even for the briefest conversation at Houghton, I could feel the effect of her sweetness on my own mood and spirits for hours afterwards. She was not only somehow instantly lovable: she seemed to make the whole world more lovable somehow because of the way she was in it -- her way of talking, of taking an interest in people and places, her calm brightness. Ginny's career is a reminder that great scholarship is as much a matter of the heart as of the intellect. Another friend sent me a passage from St. Augustine that communicates something of what I think is the most meaningful legacy of her work. Augustine writes, Scientia vero aedificat; adde ergo scientiae caritatem et utile erit scientia, non per se, sed per caritatem. “Learning builds us up; thus add love to learning and learning will be useful - not through itself, but through love.” And the love Ginny had for learning, and for the fellowship of scholars that sustains learning, made us, and makes us, love learning the more. To paraphrase Shakespeare's Falstaff, she was both learned herself and the cause that learning was in other men. Her combination of rigorous scholarship and warm, personal generosity is a trait too little seen in the republic of letters, yet one that ultimately sustains our enterprise. For those of us who knew and loved her it will remain both a challenge and a most precious memory. et te deducant in civitatem sanctam Jerusalem. The programme for the memorial service in honour of Virginia Brown held on Thursday, 22 October 2009 is available here. Tributes by her long-time colleague, Roger Reynolds, Senior Fellow Emeritus at the Pontifical Institute, and her student, Frank Coulson, Director of the Center for Epigraphical and Palaeographical Studies at The Ohio State University, delivered that day are also available. When Virginia Brown retired from the Institute three years ago after a long and productive career, we all expected her to go on to enjoy a long and even more productive retirement, dividing her time among Toronto, Cambridge, and her beloved Italia, with a few wintertime weeks in Barbados. It was not to be. On 4 July 2009, Ginny died in her sleep in Cambridge of complications from bilio-pancreatic cancer. She was 68. Virginia joined the Institute as a Junior Fellow in 1970, the first woman ever to be appointed to that position. She arrived in Toronto with a PhD in Classics from Harvard University (1969), having spent two years as a Fellow in Classics at the American Academy in Rome (1966–1968) – where she was also the first American to graduate with the Arch. Pal. Vat. awarded by the Scuola Vaticana di diplomatica e paleografia – and a further two years as the research assistant to the eminent paleographer E.A. Lowe at the Institute for Advanced Studies in Princeton (1968–1970). In 1974 she was made a Senior Fellow and was appointed Professor at the University of Toronto the following year. Her seminars in the editing of Latin texts (1971–1992) and in Latin paleography (1989–2006) served as a rigorous training ground for an impressive number of scholars. She continued the tradition started by her predecessor Reg O'Donnell of assigning students the Sapientiale of Thomas of York, earning it the dubious distinction of being the most edited medieval text yet to be published. Ginny's dedication as a teacher and supervisor won her the respect, admiration, and love of her students and was officially recognized in 2005 when the Medieval Academy of America bestowed on her the honour of its distinguished teaching award. Even more meaningful to her, perhaps, was being honoured by her students and colleagues in Classica et Beneventana, a volume of essays presented to her on her sixty-fifth birthday and representing the areas of her principal scholarly contributions: palaeography, the transmission of classical texts, and the study of the Beneventan script of medieval southern Italy and Dalmatia. She was a Distinguished Visiting Fellow at St Hilda's College Oxford (1980), and Distinguished Visiting Professor at UCLA (1992) and the Universita' degli Studi Ca' Foscari in Venice (1993). Outside the Institute Ginny's range of activities was impressive: she was secretary and editor-in-chief of the Catalogus translationum et commentariorum, member of the editorial boards of the Journal of the History of Ideas, Cambridge Studies in Palaeography and Codicology, Scripta: An International Journal of Paleography and Codicology, and The International Journal of the Classical Tradition, and a member of the Comité internationale de paléographie, to name but a few. This activity physically manifested itself in the enormous volume of letters always to be found in her mailbox and the equally impressive number of letters that she sent out. Her record of publication was equally prodigious. Among the many high points was her continuation of Lowe's work on the Codices latini antiquiores in a seminal article, co-authored with Bernhard Bischoff, in Mediaeval Studies (1985) updating the list of surviving early manuscripts. Her 2001 edition and translation of Boccaccio's Famous Women was the inaugural volume of the I Tatti Renaissance Library series, edited by her husband and published by Harvard University Press. The volume was reviewed in The New York Review of Books, in the New York Times Book Review, and in the New Republic, among other journals. She took pleasure in learning that the entire print run (4500 copies) sold out within two months of publication, making her a “famous woman” in her own right. This volume was followed two years later by an edition in the same series of Alberti's Momus, with an English translation by Sarah Knight. A collection of her essays, comprising nearly 800 pages and spanning thirty years of scholarship on medieval southern Italy, Terra Sancti Benedicti: Studies in the Palaeography, History and Liturgy of Medieval Southern Italy, was published as volume 219 in Storia e Letteratura in 2005. Ginny's passion, of course, was for the Beneventan script, an area in which she was without question the world's leading authority. As the principal investigator for many years of the Monumenta Liturgica Beneventana project to find, identify, and study items in the Beneventan script she visited innumerable archives and libraries, and published exemplary studies, including the five “New Lists” published in Mediaeval Studies in which she revealed and described hundreds of hitherto unknown items in the script. On 20 October 2006, her remarkable achievements were recognized when she was made an honorary citizen of Benevento. Soft-spoken with a southern US drawl that she never lost, even when speaking Italian, French, or German, Ginny had a core of steel and was never reluctant to speak her mind on issues that were important to her. Our thoughts are with her husband Jim and the other members of her family. The Institute and the scholarly world have lost an incomparable teacher, scholar, editor, and Latinist par excellence. We have lost an irreplaceable human being, a valued colleague, and a dear friend.